There is an interview in the upcoming issue of OG in which the person being interviewed is asked, among other things, what has been his most terrifying moment underwater? The person in question, Raymond, has been diving for years and has thousands of logged dives all over the world in all sorts of conditions. His response? 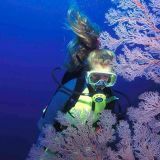 A dive in the Maldives that was shallow, had no current and very few features. The terrifying part? He lost a camera. Not just a camera, but an entire underwater camera set-up. The whole thing. One minute it was there, on the flat, sandy bottom….the next minute it was gone. And it wasn't his. He was assisting. The camera belonged to Michael Aw. That's it…Raymond's most terrifying moment underwater. Many of you might not be able to relate to this. However, trust me when I say it is as troubling as Raymond makes it sound. I can relate, because it happened to me as well, and like Raymond, it ranks as one (two actually) of the most terrifying dives of my life. It all started with the Cochran Nemesis air integrated computer. I'm not sure how many of you even remember this. It was one of the very first air-integrated computers, and I was lucky enough to have a friend of mine offer to let me borrow it for the trip. Apparently, most of them didn't work very well….like any new technology it had bugs that needed to be worked out. But mine worked great. And it had a feature that I dearly loved…..a breathing parameter. This algorithm tracked how many breaths per minute I was using. That was super cool because while I normally surfaced with a considerably larger reserve of air than most other divers (a fact I was extremely proud of), the breathing parameter (BPM) function on the Nemesis meant I could fine-tune that sucker down to a point of Zen-like efficiency. My average was 12 BPM, but with some concentration, in the right conditions, I could get it down as low as 8. Of course, this required that I monitor the screen on the Nemesis regularly, and I spent a fair amount of time switching back and forth between the Nemesis' two screens to maintain my state of Zen-like breathing. This ended up being my undoing. We had encountered a slope that was literally awash with soft corals, sea turtles and sponges. 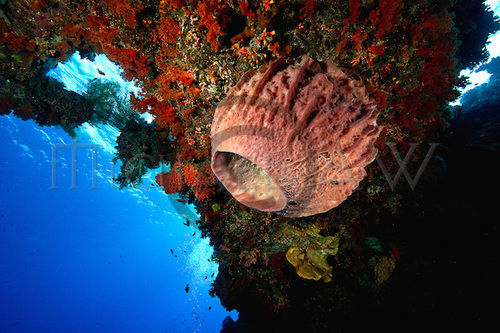 The sponges were all pretty uniformly the same size and shape….and color. They were about two feet tall, twelve inches across and orange. Orange…don't forget that part. Anyway, it seemed to be macro-heaven for the photographers. The conditions were calm, visibility was good and the photo shoot was progressing right along. I had two cameras, one over each arm and was busy trying to spot interesting macro subject material. However, Michael had found some remarkable pipefish that had taken his complete attention and two rolls of film. We clearly weren't going anyplace for awhile, so I turned my attention to my Nemesis and its BPM function. I was trying to meditate myself down to 6 BPM, but I hadn't hit it yet. The Cochran was mounted on my left wrist so I had to twist it to check the screen, which meant the camera changed positions as the strobe arm rolled across my forearm. That particular camera set-up had a couple of Ikelite strobes mounted on it, including an Ikelite Substrobe 150. Let's pause a moment here. For those of you who are not familiar with a Substrobe 150, this was one of Ikelite's premier strobes back in the day. They were big and clunky and could light up a fair amount of ocean; they were expensive as well as orange. On this particular set-up, the Substrobe 150 was being used as a slave, so it did not have a sync cable attaching it to the top of the housing; the strobe arm served as the only anchor point. The sync cable was attached to the strobe on the right. The pipefish had moved on, and so had Michael. However, I was still caught up in my attempt to reach a breathing parameter of 6 BPM. While Michael meandered from orange sponge to orange sponge looking for more macro material, I hovered a few feet away concentrating on slowing my breaths. Somewhere, sometime, somehow during a space of what could not have been more than a few minutes, the constant rotating of my wrist to view the computer screen must have allowed the strobe arm attached to the Substrobe 150 to come loose; however; I didn't notice. We continued up the slope until Michael ran out of his third and final roll of film. He looked up at me and signaled it was time to get out of the water. Then he froze and focused on a space in the general vicinity of my left arm and pointed. I looked down. At first I didn't understand what was wrong. I had two cameras…..life was good….. He pointed again, this time at the empty slot on the top of the housing where the strobe arm should have been anchored. I didn't think to check my BPM in that moment, but I am absolutely sure that it shot through the roof as my state of Zen-breathing dissolved into a state of panicked hyperventilation. I almost started crying. The shallow slope below me with its hundreds of orange sponges suddenly looked like it might have been the nursery where Ikelite grew all of its Substrobe 150s. We searched the slope for the strobe. No luck. Michael wanted to surface, but I wanted to keep looking. I had just lost his most expensive strobe, and even worse, it's not like we were in a location where he could just pop down to the local camera store and pick up another one. Trying to imagine how I was going to explain myself later, I felt terrified. In case you are not feeling connected to the "terrifying" angle here, let me explain. We were a little more than 2/3 of the way through a 6-week trip in the middle of one of the more remote parts of the Indonesian archipelago, and although the strobe was alarmingly expensive, the larger concern for me was that I had not seen a camera store since Singapore four weeks earlier. Add to that the equipment I had just lost was not even mine….it belonged to a photographer I had only recently even met. As I recall, we had two Substrobe 150s along with us, and I had just lost 50% of our equipment inventory. I suddenly imagined that any future photo ops on this particular trip that were missed due to inadequate lighting could be squarely assigned in my direction. I felt sick. We surfaced, but I intended to return and find the strobe. There was a general consensus that looking for the strobe would be an exercise in futility, but I went back on another dive anyway.I spent a heart-wrenching hour searching a slope of medium sized orange barrel sponges for a medium sized orange strobe. I vaguely heard the Baruna honk at me a number of times to come back onboard. I ignored the honks for a long time until the engines actually started up. I guess we were indeed leaving. My unsuccessful search was over. I had been responsible for the complete loss of some very expensive gear that did not belong to me in a part of the world where finding a replacement was impossible. Wow. I was still imagining how I was going to explain myself. At that moment, taking my chances staying underwater and letting the Baruna leave without me did not seem like such a bad option. The second most terrifying dive of my life. Back onboard, I was miserable. To this day, Michael has never said anything at all to me about having lost the strobe, but I must have looked like a wet dog who'd been left in the backyard during a storm with no food for over a week. Luckily for me, there was someone onboard who took a much appreciated moment to try to make me feel better about it. That well-known photographer that we had been expecting that I mentioned a few posts back? Well, his name was David Doubilet and he was along on this part of the trip. It turns out he was traveling with a stash of Swiss chocolate and a bottle of scotch, and along with sharing some of that with me, he shared a couple of stories of his own about past underwater equipment disasters. In the end, he said, for people who choose to take electronics into the underwater realm, it is not a question of "if" tragedy will eventually strike, but "when" and that all photographers know and accept this as fact. I'm not sure I was doing cartwheels after the chocolate and scotch session, but I was at least no longer in danger of throwing myself overboard. In any case, I have always been grateful for his efforts in trying to make me feel better about the whole thing. For years I had assumed I was the only assistant to have ever lost any camera gear during a dive. It turns out that is not true, of course, and along with many other stories, Raymond's interview has cheered me up immensely. After all, so far I have only lost one strobe, so in theory, I can comfortably misplace a couple more strobes as well as an entire housing and camera inside without any further stress.Thanks, Raymond. My future as a qualified assistant is looking brighter. However, if I ever find myself on another dive on a shallow slope covered in orange barrel sponges someplace in the east of Indonesia, I know I'll have to suffer through at least one shudder of remembered terror.